Juventus superstar Paulo Dybala surprised fans yesterday evening after he played a bizarre one-two with teammate Rodrigo Bentacur when the ‘Old Lady’ faced Inter Milan. 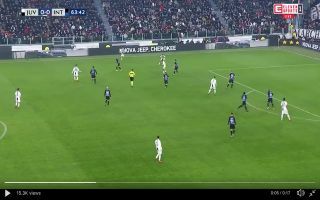 In the 63rd minute of the tie, Bentacur launched a speculative pass forward and instead of the Uruguayan’s pass going into the path of one of his teammates the ball struck Dybala so hard that the ball came straight back to Bentacur’s feet. There certainly isn’t anything Dybala wouldn’t do for his team. Juventus scored not long after Dybala’s heroics. Target-man Mario Mandzukic put the ‘Old Lady’ ahead in the 66th minute and Max Allegri’s side were able to hold on to their lead till the very end. Following last night’s win Juventus have now extended their lead at the top of the Serie A table. They are an impressive 11 points above second-placed Napoli. Juventus’ dominance in Serie A looks set to continue.